Every year we can see a steady increase in engineering knowledge and capability around the globe, concurrently the level of designed safety in all of our engineering products has been steadily increasing too, for many engineering industries Safety is now a critical factor in the design and functionality of products. Synoptix takes this movement towards a robust Safety culture seriously and we have the capability to provide our customers with in depth safety analysis and Risk management solutions. We are well versed in developing high level risk management strategies on complicated systems, from rolling stock to naval warships, all of our safety engineering activities ensure that where possible all safety concerns within the scope are identified, and where required, mitigated to such a level where the risk can be considered As Low As Reasonably Possible (ALARP) for its intended application. Due to our strong links to the Aerospace and Defence industries, we have a wide selection of highly proficient safety engineers with years of relevant industry experience in a variety of engineering roles. We are capable of providing independent assessments including recommendations for improvements, as well as certification to a very broad range of industry standards. Engineering industry standards and certifications are paramount to the validation and evidence of product/project Safety. If all of the appropriate procedural and project regulations have been implemented into the design, manufacture and testing of an engineering product or project a high level of Safety can be proven. Each industry has its own set of governing regulations, often complex and safety critical systems will require multiple certifications in order to pass Safety validation. Synoptix can utilise Safety and Certification SMEs to provide specific industry focussed expertise, for example we have recently deployed a systems engineer with over 10 years of aerospace software certification experience to enable the certification of a brand new flight deck software product against DO-178B/C (Software Considerations in Airborne Systems and Equipment Certification) & DO-254 (Design Assurance Guidance For Airborne Electronic Hardware), this engineer will work to ARP4754 (Guidelines for Development of Civil Aircraft and Systems) and ARP4761 (Guidelines and Methods for Conducting the Safety Assessment Process on Civil Airborne Systems and Equipment). Synoptix can produce comprehensive qualification plans to provide validation that our customers products/projects meet the required safety constraints. 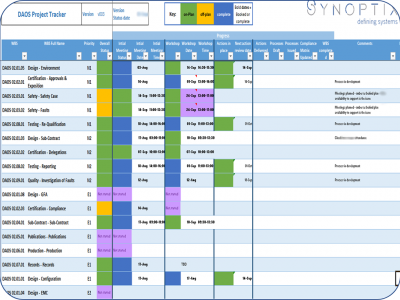 To supplement the validation of systems Synoptix will regularly perform Gap Analyses to identify any procedural weaknesses or product non compliances against industry standards and certifications. We have experience and expertise in providing detailed FMEA (Failure Modes & Effects Analysis) and FMECA (Failure Modes, Effects & Criticality Analysis) on a wide variety of products, systems and services. Synoptix recently performed a FMECA on a revolutionary tidal turbine system, head to the Energy page to find out more. Synoptix has the ability to perform a number of Safety analysis activities, including but not limited to: Independent Safety Assessment, Risk Qualification, Certification, Fault Tree modelling, and the creation of detailed risk matrices. Risk matrices are one of the most common tools used in the analysis of risk, this activity allows potentially hazardous situations to be assessed for severity and likelihood of occurrence. Performing such an analysis will enable the identification of the most safety critical and performance limiting risks, typically those with a high chance of serious injury or death and those with a high probability of occurrence. Once a risk has been established further analysis can take place which will result in appropriate mitigation/prevention measures being adopted. 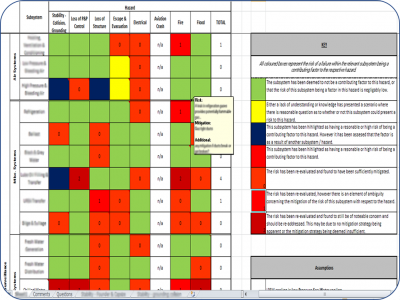 The slider on this page shows an example of a typical risk matrix.